How can you tell if a durian is ripe? 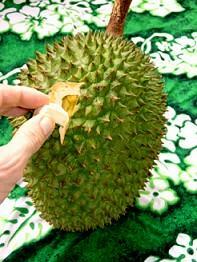 "To choose a durian, pick a fruit which is comparatively light and whose stem appears big and solid. 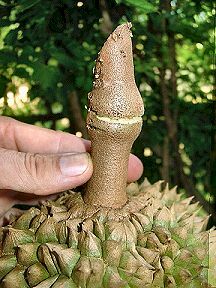 When shaking a good durian, the seed should move. Maturity is indicated when the middle of the fruit exudes a strong, but not sour smell. Finally, an inserted knife should come out sticky — this is the best indication that the fruit is ripe. Cut fruit perishes fairly rapidly. Avoid fruit with holes: worms may have prior claims." 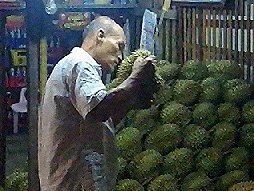 Determining the ripeness of a durian is in Southeast Asia a fine art practiced at every marketplace countless times daily during durian season, almost a ritual. Prospective customers examine, sniff, and shake the fruits, while sellers usually have a special padded tapping stick with which they strike each durian to demonstrate its particular "thunk" sound, almost like musicians testing some kind of natural jungle percussion instrument. They also often will cut a triangular flap in the rind to show the consistency of the fruit flesh inside, which the prospective customer may peer into, smell, and touch with a fingertip. 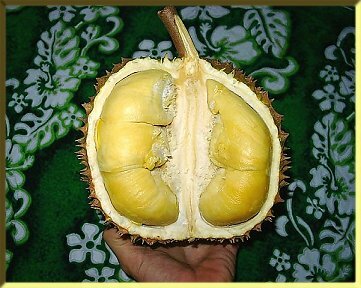 Like experienced winetasters, experienced durian eaters can often accurately tell what is the variety, in what region it was grown, and what is the approximate age of the tree it came from, just by inhaling a durian’s fragrance. Those who prefer overripe pulp. That is all certainly true. We are (not-strictly) soft-ripe durian lovers, by the way.